I’ve been reading memoirs ever since I started writing my own in 2011. 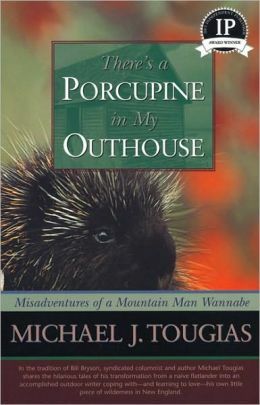 There’s a Porcupine in My Outhouse by Michael J. Tougias turned out to be a fantastic read and I highly recommend it to anyone. Where did I find this book? I actually bought it at a gift shop in Northern New Hampshire. I almost always buy books at tag sales, used bookstores, or library sales, but this one caught my eye? Why? I love porcupines. My family has a house in Maine and the porcupines are often within sight, constantly munching on the tops of Hemlock trees. Once, I walked right up to one and took its picture. These creatures have the cutest faces and I’ve been in love with them ever since! While my father was always irritated that porcupines ate his trees, my mother made sure that we gave the porcupine a wide berth out of respect. She grew in a family that had to hunt for its own food. If her father didn’t kill anything, the family didn’t eat. She considered the porcupine a food of last resort, as a desperate hunter could club them in broad daylight. Tougias’ book is a wonderfully funny tale of his learning the outdoors after the purchase of a rustic cabin in Vermont. One of my favorites stories was in the very beginning when the author thinks that there might be a bear living underneath his cabin. Tougias writes, “Beavers, mink, raccoons, and even the porcupine I had expected here, but not something bigger, stronger, and with more teeth than me. I hadn’t counted on a bear. The realtor had never said a thing about this. What happened to full disclosure? If a property has carpenter ants, realtors are required to tell you. Carpenter ants are bad, very bad, but they eat the house, not you.” Any New Englander would just have to laugh as we’ve all had creatures, large and small, sharing the outdoors (and sometimes indoors) with us. Tougias book is full of his discoveries about nature that are presented quite humorously. I won’t spoil the book by sharing any more of the gems, but will report that I laughed all the way through it. For reference, the author’s website is http://www.michaeltougias.com/ although I don’t see anything on it regarding his porcupine memoir.